It’s that magical time of year — it's mere days before Halloween and you’ve been invited to at least a dozen parties. You want to be a superhero, but you left everything to the last minute. I'll spare you the suggestion to look deep inside your soul for inspiration — you aren’t here for that. 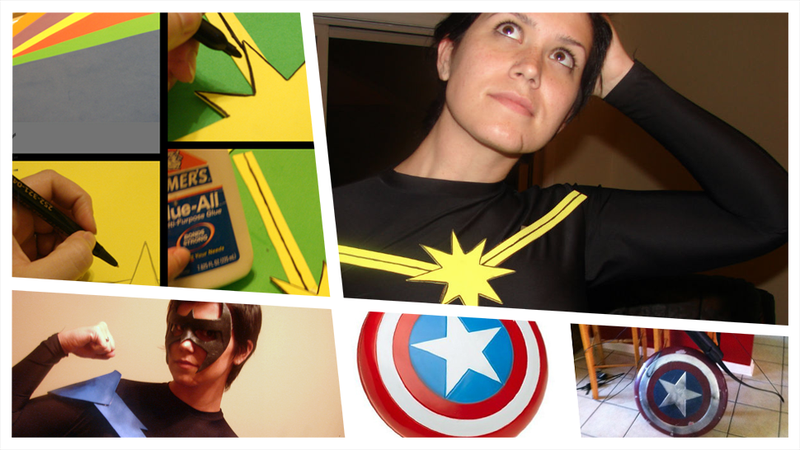 I’ve been in the "cosplay scene" for over 10 years, so I know a few tricks when it comes to throwing together a cheap but effective superhero costume out of locally obtained items. Let's get started! The classic superhero base is a set of tights. You can do a lot with leggings and workout gear. Seriously guys — women’s leggings come in every color under the sun, and you can use that to your advantage, especially if you're on the slender side. With a fitted base in the right colors, you could be just about any of the guys in the Justice League (except for Cyborg, but if you wanted to be Cyborg you would have known that three months ago). If your hero of choice isn’t a fan of pants and you don’t want to spend the night half-naked and cold, hit up a local dance store or costume shop for thick tights in your flesh tone. Yoga shorts and hot pants are perfect for that classic "underwear on the outside" look. The only real secret to this part is to think outside the box. Guys, brave the ladies section. I’m telling you. Do not fear the 99 cent store on this one. For a few bucks, you can get Thor’s hammer, Batman’s cowl, or some Black Widow wrist darts. They look like what they are – cheap toys — but with a little work, they’re perfect. Be creative here; a devil pitchfork painted gold for a sweet Aquaman trident. This is my husband’s Captain America shield. It started life as one of these toy shields, but with a bit of spray paint it looks like it’s been through a World War. Shoe polish is a favorite among cosplayers – wipe black shoe polish across your prop, then quickly wipe a cloth across it before it dries. The shoe polish will remain in the grooves, making your toy look like a gritty superweapon. The secret is craft foam. You know, that multicolored fun foam that comes in huge packs at the craft store. Kids use it for wall hangings and stuff, but you’re going to use it to make yourself a hero. Heating a craft foam sheet with a heat gun, or a blow-dryer set to high, causes it to become floppy and shiny. While warm, rest it across a mask form or mold to cool. Once cooled, it retains the shape and is almost rubbery, like the Nightwing armor I made, shown below. The mask base is also craft foam, painted with some spray-on black rubber from Home Depot for that Gotham City look. These here were made in an hour, and are attached to base garments with double-sided tape. I hear you. You’re a street-level hero. You don’t listen to rules, and you don’t do brightly colored spandex. Settle down, Jason Todd, you can have a cool superhero Halloween costume, too. There's a whole host of comic heroes and villains who wear stuff you already have or can easily get with a quick surplus store trip. Red Hood, X-23, Wolverine, and Storm all get a little punk with their look. And don’t be afraid to go as an alter ego! Clark Kent is easy mode if you own a suit and vest. Guys, throw on a torn dress shirt and tattered purple hipster pants — the Hulk’s got to turn back into Bruce Banner sometime. Ladies, if you’ve got a pantsuit and a pair of biceps to match, paint yourself green and party hard as Jennifer Walters — better known as She-Hulk. A final note: While it's fine for apple bobbing and doing Halloween-themed shooters, please do not actually attempt to fight crime in your costume. Wanna see more? Ten Fiesta agents got their Halloween on early and dressed their Fiestas as superheroes, all for the chance to meet some of the greatest minds in comics. Now you can make your own, all thanks to the Fiesta Movement. Tini Howard is a freelance blogger, journalist, resume writer, and novelist.